Waiting on Wednesday is a weekly meme hosted but Jill at Breaking The Spine. It features each bloggers most anticipated books! 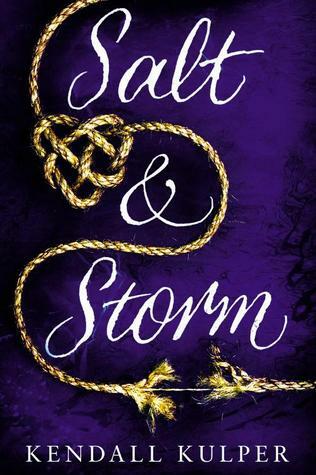 This week my pick is SALT & STORM by Kendall Kulper. "Sixteen-year-old Avery Roe wants only to take her rightful place as the witch of Prince Island, making the charms that keep the island’s whale men safe and prosperous at sea. But before she could learn how to control her power, her mother, the first Roe woman in centuries to turn her back on magic, stole Avery away from her grandmother. Avery must escape from her mother before her grandmother dies, taking with her the secrets of the Roes’ power. When Avery awakens from a dream foretelling her own murder, she realizes time is running short—for her and for the people of her island, who, without the Roes, will lose their ships and the only life they know. With the help of Tane, a tattooed harpoon boy from the Pacific Islands, Avery plots her escape from her mother and unravels the mysteries of her mother’s and grandmother’s pasts. Becoming a witch may prevent her murder and save her island from ruin, but Avery discovers it will also require a sacrifice she never expected—one she might not be able to make." Why I Can't Wait: You guys, I haven't read a book about witches in ages, and this one sounds the perfect book to break this curse. I mean, the main character wakes up from a dream that foretells her own murder? Whoa. This book sounds like an intense and fabulously amazing novel. Plus, heeeey...tattooed harpoon boy. He sounds like a hottie, rawr! witches! This is definitely on my to read list too! I'm definitely excited for this one, too---in all it's witchy goodness! I've never heard of this one, but witches are always fun! I'll have to keep a lookout for this one!